Yggdrasil, just like the mythical tree the company is named after, has strong roots and extensive branches that connect various facets of the industry into a comprehensive whole. This company has been pumping out quality casino games for years now, always approaching their games from a unique and innovative perspective to provide something a little different for players. Their extensive reach within the industry and wealth of talent makes them one of the most consistently reliable developers out there. They may however have outdone themselves with their latest full 3D pokie, Jungle Books. This pokie introduces the unique new Fusion Realms feature that essentially allows a player to customize their pokie experience by deciding which bonus games they wish to take part in and what features should be active during play. It even extends to how the paylines are set up and how the reels are structured. The pokie follows the plot of the books and Disney movies with the human boy Mowgli joined in the jungle by 4 animal friends. The Fusion Realms system is based on the use of these characters. You will select a main character that will then activate his features on the reels, but you will also be able to get a secondary character that will be a guest in your active realm and provide you with additional bonus features during the game. This means that players can potentially make 45 different combinations with their selected character’s features, adding ridiculous replay value for fans. You start play by choosing a character that will serve as your main character. Players will have 68 paylines to activate as well as a Both Way Pay feature where you can get payouts no matter which way your combination form, both from right to left and left to right. You can then select a secondary character that will appear randomly next to the reels for up to 3 spins, meaning players will have the chance to unlock any of the 4 bonus features that will become active with two onscreen characters. Yggdrasil aren’t just innovating in the pokie space with Jungle Books, the game will also be running on the developers new custom software, the revamped iSense2.0+, a HTML client framework service. This high level of optimization, the unique approach to the slot design and Yggdrasil’s dedication to their fans and stakeholders are all the qualities that make this developer one of the best in the world. Despite the extreme competition faced in the market, there are still a handful of developers who keep their wits about them and find new ways to truly innovate their pokies. 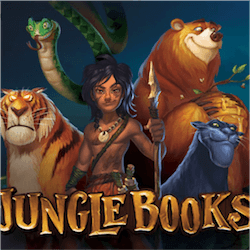 Jungle Books has been available from the 20th of September and delivers premium entertainment with every spin.